It’s on again, the Titanic battle for the Al Ross “Buzzard” Cup, this Saturday 13th April @ Ourimbah Rugby Park 3pm. 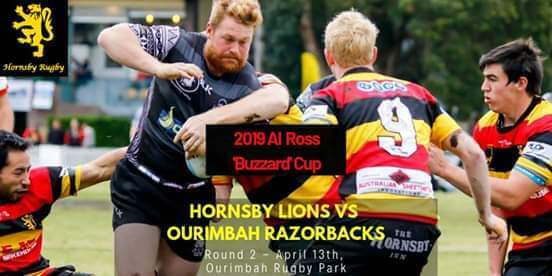 In celebration of the life of an Ourimbah Rugby and Hornsby Rugby legend, the Buzzard Cup is contested annually by the Lions and the Razorbacks. Although a one sided affair in recent years, the Lions have prepared well in 2019 and plan to do Al proud. Very rarely in the life of a Rugby Club does a character like Al Ross come along, hence worth getting along to the game at Ourimbah Rugby Park and remembering this legend.